Launch from the Baikonur Cosmodrome (Mikhail Tyurin, Richard Mastracchio and Koichi Wakata with Soyuz TMA-11M). 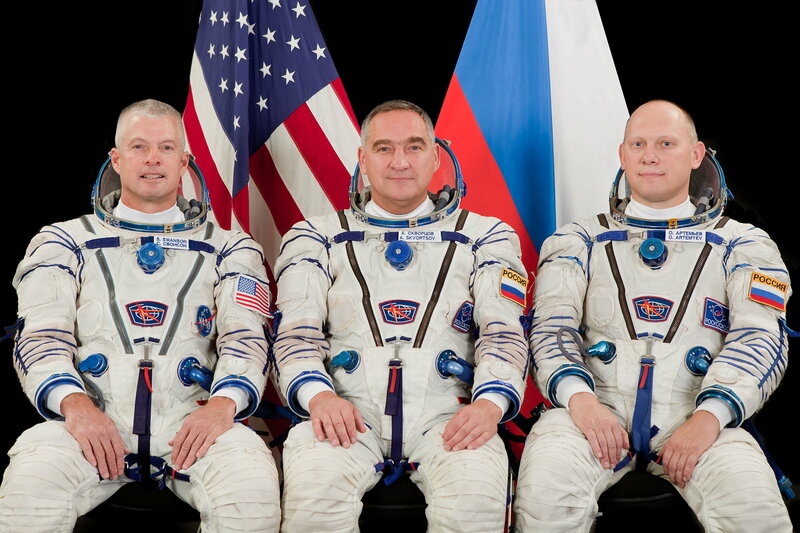 Oleg Kotov, Sergei Ryazansky and Michael Hopkins were onboard since September 26, 2013 (arrival with Soyuz TMA-10M). 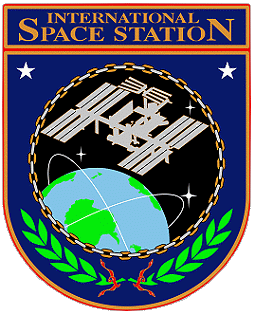 ISS Expedition 38 began with the undocking of spacecraft Soyuz TMA-09M on November 10, 2013 at 23:26 UTC. 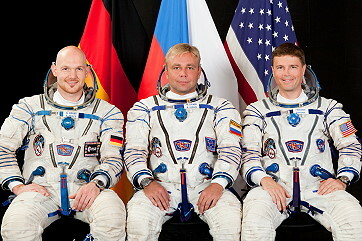 The former Expedition 37 (Fyodor Yurchikhin, Luca Parmitano and Karen Nyberg) returned safely to Earth. With the arrival of Soyuz TMA-11M on November 07, 2013 the Expedition 38 became a six-person-crew. Soyuz TMA-11M carried Oleg Kotov, Sergei Ryazansky and Michael Hopkins to the space station. Progress M-21M was launched on time at 20:53:06 UTC on November 25, 2013 from the Baikonur Cosmodrome in Kazakhstan. 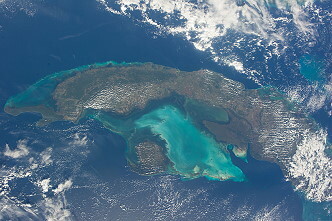 The Kurs-NA docking system was tested by Progress M-21M during a fly-by of the ISS on November 28, 2013. 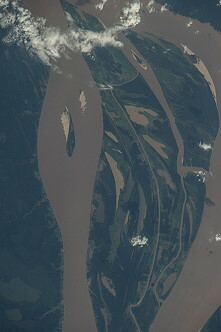 Progress M-21M later docked with the ISS on November 29, 2013 at 22:30:20 UTC. 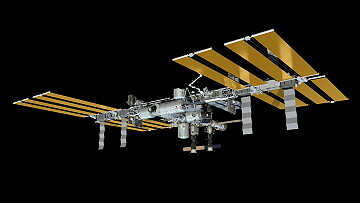 Progress M-21M delivered to the ISS about two and a half tons of cargo, including fuel components, water, service equipment, equipment for scientific experiments, containers with food and parcels for the crew. The total mass of all delivered goods is 2398 pounds (1,088 kg). 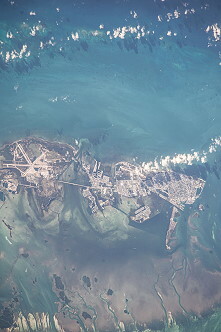 One of the International Space Station's external coolant loops shut down on December 11, 2013 after sensors detected lower-than-expected temperatures, NASA officials said. The loop's pump was reactivated, but a critical flow control valve apparently was not operating as expected, prompting flight controllers to shut down non-critical systems in the forward part of the complex to reduce the load on the operational coolant loop. 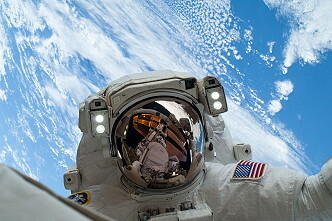 After an exhaustive effort to come up with a workaround to fix a balky valve in one of the International Space Station's two coolant loops, NASA managers decided on December 17, 2013 to change gears and press ahead with at least two and possibly three spacewalks to replace a refrigerator-size ammonia pump module. The first spacewalk for repair work was performed by Richard Mastracchio und Michael Hopkins on December 21, 2013 (5h 28m). The EVA mainly focused on disconnecting the failed loop A pump module from its location on the Starboard 1 (S1) Truss - including the infamously difficult ammonia disconnections. Prior to the pump module's removal, ground teams will shut down the loop A pump module, since it currently remains powered as it is still providing cooling to external equipment. This means that some external power distribution equipment will lose its cooling and need to be shut down, however an internal Lab-Truss Contingency Jumper (LTCJ) has been used to provide alternate sources of power to some equipment to reduce the impacts of the shut-downs. 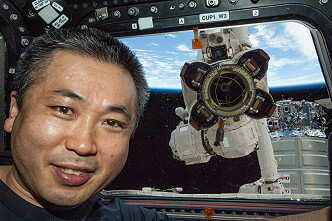 First the astronauts took a "ride" during the EVA, with the arm being controlled by Japanese astronaut Koichi Wakata from inside the ISS. Michael Hopkins began to remove the old pump module. Richard Mastracchio und Michael Hopkins together moved on to by far the hardest task of the day - disconnecting the four ammonia lines from the failed pump module. Next they prepared a spare pump module located at the External Stowage Platform-3 (ESP-3) on the S3 Truss. The second spacewalk for repair work was again performed by Richard Mastracchio und Michael Hopkins and occurred on December 24, 2013 (7h 30m). The two spacewalkers headed out to the Starboard 3 (S3) Truss, to External Stowage Platform-3 (ESP-3), which is the location of the spare pump module that will be installed into the ISS in place of the failed pump module that was removed from the S1 Truss on previous EVA. The duo then disconnected four electrical connectors from the spare pump module, and had to drive four bolts to remove the spare pump module from its adapter plate housing on ESP-3. Michael Hopkins then attached a handling aid to the pump module known as a "scoop", and then hitched a ride on the end of the Space Station Remote Manipulator System (SSRMS) over to the pump module installation site at the S1 Truss, where upon the spare pump module was inserted into its slot inside the Truss structure itself. Four bolts then were driven to attach the new pump module to the ISS, and five electrical connections were made. 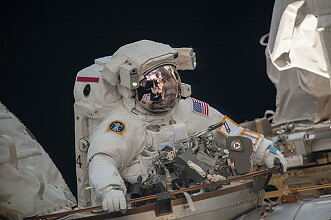 At this point, the two spacewalkers began to mate the four ammonia Quick Disconnect (QD) jumpers to the new pump module, and open their valves in order to allow ammonia to flow to the new unit. 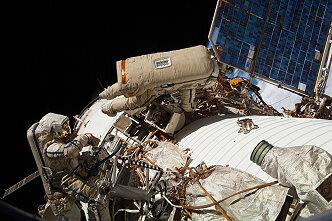 The next spacewalk was performed by Oleg Kotov and Sergei Ryazansky on December 27, 2013 (8h 07m). The cosmonauts attempted to install a pair of cameras on the Zvezda Service Module as part of a Canadian commercial endeavor designed to downlink Earth observation imagery and to refresh experiments. 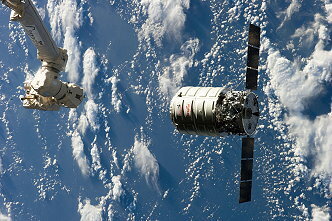 Cygnus CRS Orb-1 was launched on January 09, 2014 at 18:07:05 UTC. Cygnus CRS Orb-1, also known as Orbital-1, is the second planned flight of the Orbital Sciences Cygnus unmanned resupply spacecraft, its second flight to the International Space Station and the third launch of the company's Antares launch vehicle. 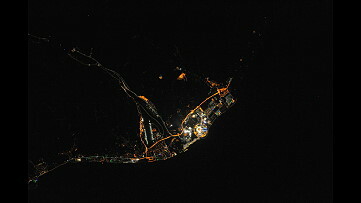 Launch of Orb-1 was scheduled for November 2013, but a series of delays pushed the date to December 20, 2013. The Antares launch vehicle rolled out from the Wallops Horizontal Integration Facility (HIF) on the morning of December 17, 2013, and was later erected at Launch Pad 0A. Later that day, due to the need for a series of spacewalks to fix a faulty coolant system on the space station, NASA directed Orbital to stand down the Antares rocket. Antares was rolled back to the HIF and time-sensitive cargo removed. The launch date was rescheduled.Orbital Sciences' Cygnus cargo spacecraft was moved into installation position by astronauts using a robotic arm aboard the International Space Station January 12, 2014. The spacecraft is loaded with 2,700 lbs (1,225 kg) of vital science experiments, crew provisions, spare parts and other hardware. Cygnus wremained attached to Harmony until unberthing on February 18, 2014, 10:25 UTC. The spacecraft was sent toward a destructive re-entry in Earth's atmosphere on February 19, 2014 at 18:20 UTC. Astronaut Michael Hopkins grappled the spacecraft at 11:08 UTC and Koichi Wakata attached Cygnus to the space station's Harmony Node at 13:05 UTC. 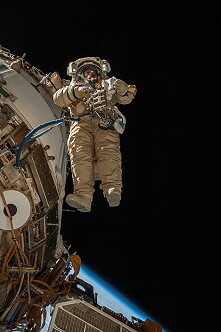 Oleg Kotov and Sergei Ryazansky left the space station for the fourth space walk on January 27, 2014 (6h 08m) to reinstall a pair of high-fidelity cameras as part of a commercial endeavor between a Canadian firm and the Russian Federal Space Agency. 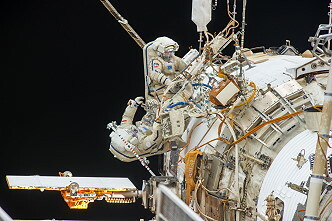 Oleg Kotov and Sergei Ryazansky previously attempted to install the cameras during a marathon 8-hour, 7-minute spacewalk on December 27, 2013 - the longest Russian spacewalk ever conducted - but had to return them to the airlock when Russian flight controllers did not receive the expected telemetry. The Progress M-22M was launched on February 05, 2014 at 16:23 UTC from the Baikonur Cosmodrome in Kazakhstan. The freighter docked with the Pirs docking compartment on February 05, 2014 at 22:22 UTC, less than six hours after launch. 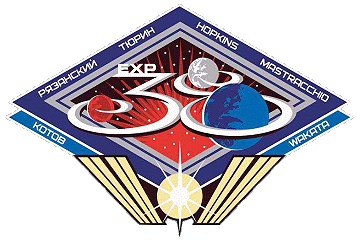 The Progress spacecraft carried 2.370 kg of cargo and supplies to the International Space Station. Expedition 38 included a variety of research, ranging from protein crystal growth studies and biological studies of plant seedling growth to technology demonstrations that will improve understanding of liquid movement in microgravity to student experiments that observe celestial events in space. 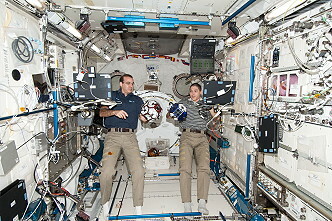 One of several key research focus areas for this expedition is human health management for long duration space travel, as NASA and Roscosmos prepare for two crew members to spend one year aboard the space station in 2015. Multiple Protein Crystal Growth Experiments: High quality crystals grown on the space station are used to determine protein structure, which helps researchers better understand protein function. This knowledge will lead to designing new therapeutics for diseases. In fact, a previous study of protein crystals on the space station led to discovery of a water molecule in a protein-inhibitor complex that is now being used to develop a treatment for Duchenne muscular dystrophy. 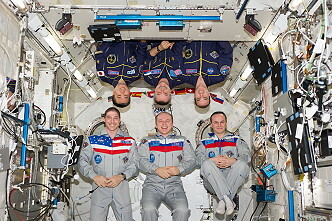 Several new protein crystal growth experiments will be conducted during Expedition 38. One called the Commercial Protein Crystal Growth - High Density Protein Crystal Growth Modified (CPCG-HM) uses the microgravity environment to determine the best crystal growth strategies for optimal protein crystal structures. Another investigation, the Center for Advancement of Science in Space Protein Crystal Growth High Density Protein Crystal Growth-1 (CASIS PCG HDPCG-1) seeks to crystallize huntingtin, a protein associated with Huntington's disease. The CASIS PCG HDPCG-2 investigation seeks to crystallize the cystic fibrosis protein and closely related proteins to improve treatments for cystic fibrosis. The fourth new protein crystal investigation, the HDPCG (Merck) study, seeks to crystallize a human monoclonal antibody, an antibody capable of identical copy, developed by Merck Research Labs. This antibody is currently undergoing clinical trials for the treatment of an immunological disease. The Multi-Gas Monitor is a technology demonstration of a portable laser spectroscopy device that can simultaneously measure oxygen, carbon dioxide, ammonia and water vapor in microgravity. Spectroscopy studies the interaction between matter and radiated energy, and the data is often represented by a spectrum. Laser spectroscopy points a laser beam at a sample, resulting in a characteristic light source for analysis. The T-Cell Activation in Space investigation seeks to identify the defect in T-cell activation, an immune response used to fight foreign antigens, during microgravity exposure. This research also can help in understanding and treating a range of auto-immune diseases such as arthritis and diabetes. Identifying this defect may someday inhibit the decline of the immune system as a normal part of the aging process. 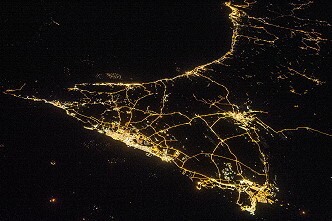 The Optical Payload for Lasercomm Science (OPALS) investigation tests the use of laser optics to transfer information to the ground. The switch from radio frequency to a laser beam - which can be hundreds to thousands of times narrower in comparison to radio waves - could improve communication data rates by a factor of 10 to 100. This advanced approach stands to increase the amount of data future missions can send using the same power resources, optimizing research return. 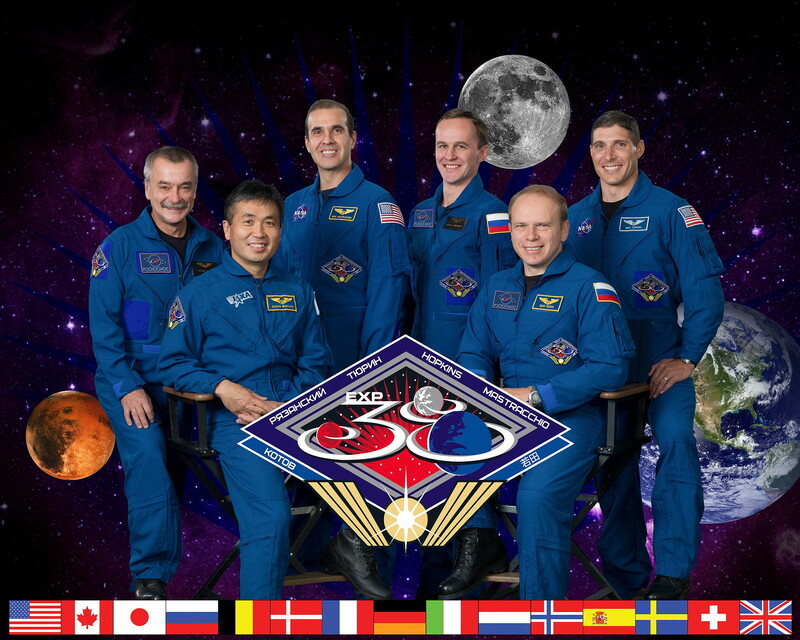 Finally the station command changed from Russian cosmonaut Oleg Kotov to Japanese astronaut Koichi Wakata. 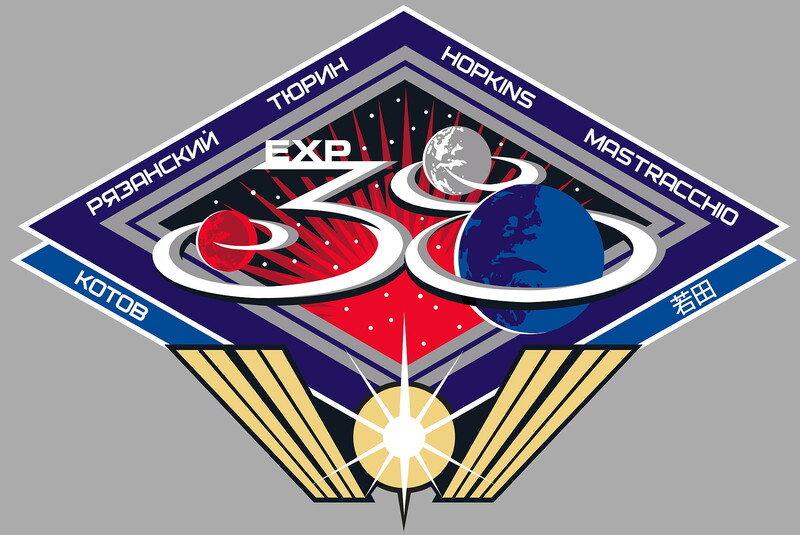 With undocking of Soyuz TMA-10M, carrying Oleg Kotov, Sergei Ryazansky and Michael Hopkins the Expedition 38 concluded and the new ISS Expedition 39 began. 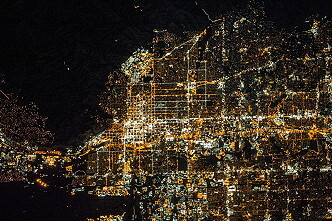 Windows on Earth (Windows on Earth).